These aren't the most popular predictions, but they're certainly possible. Nobody has a crystal ball that can predict the future, especially when it comes to the investing world. For instance, at the beginning of 2018, how many people predicted that a trade war would break out, or that the yield curve would invert, prompting fears of a recession? With that in mind, I'd like to take a shot at some bold (but realistic) projections of my own for 2019. In general, I think 2019 will be a stronger year for the stock market than most experts seem to believe, and here are five reasons why. Simply put, the trade war with China is bad for everyone. Nobody wants big tariffs, and both sides stand to lose a lot if this continues past the recently extended deadline to make a deal. Plus, President Trump knows the trade war is putting pressure on the stock market, and it's well-known that he considers the market's performance to be a barometer of his success. So I think the two sides will come to some sort of permanent agreement about trade early in 2019, putting the trade war behind us and causing investors around the world to breathe a collective sigh of relief. Despite the recent stock market volatility, the U.S. economy really is quite strong. Unemployment is below 4% and the most recent weekly jobless claims figure was the lowest it's been in nearly 50 years. We're finally starting to see significant wage growth, and inflation is running slightly ahead of the Federal Reserve's 2% target. Plus, all indications point to high consumer confidence as we head into the holidays. Sure, trade is an uncertainty, but as I said, I don't see the trade war lasting for too much longer. Once that's out of the way, I think the Fed will (justifiably) raise rates a few times in 2019, despite recent expert predictions of no more rate hikes. The most recent projections from the policy-making Federal Open Market Committee members indicate a mean prediction of three quarter-point rate hikes for 2019, and I think we'll get them all. Banks have been one of the worst-performing areas of the stock market in 2018. There are a few reasons for this. The effects of tax reform on bank earnings were well-known before 2018 began, there's growing concerns about an economic slowdown, and rising interest rates haven't exactly panned out as many bank investors had hoped, just to name a few. I see this reversing course in 2019. I've already said that I think the trade war will be over sooner rather than later, and if we do continue to have strong economic data and a few more rate hikes in 2019, the long end of the yield curve should rise, translating into higher profits for banks. I've said before that there's a big buying opportunity in the financial sector right now, with many rock-solid institutions trading at or near 52-week lows, and some like Bank of America and Goldman Sachs trading for even less than book value. 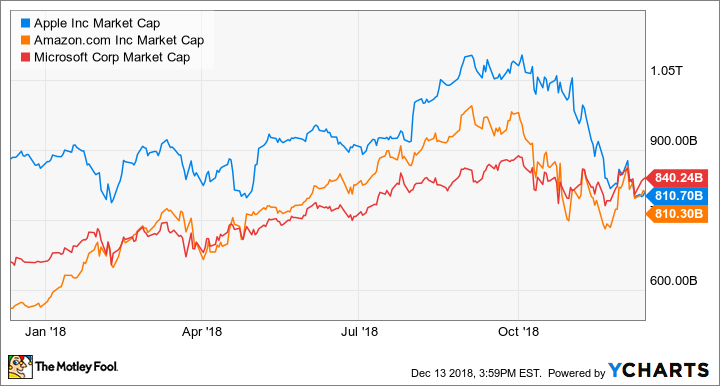 After becoming the first publicly traded U.S. company to reach a $1 trillion market cap, Apple (NASDAQ:AAPL) has been absolutely pummeled recently. Instead of definitively being the largest company in the market anymore, Apple is in a three-way battle with fellow tech giants Microsoft and Amazon. AAPL Market Cap data by YCharts. Simply put, Apple is a phenomenal business. Its customers are fiercely loyal and are willing to pay a premium for the company's products. As the services businesses (App Store and such) continue to grow, the tech titan's revenue stream and cash flow will get even larger. A 27% stock drop simply because of one quarter's guidance and the company's decision to stop reporting product-level sales figures is absurd, especially when Apple is otherwise doing great. So I predict that not only will Apple firmly regain its top market capitalization spot, but it will rise to new highs in 2019 after the holiday season results come out and investors realize their fears were overblown. It's been several years since Warren Buffett and Berkshire Hathaway (NYSE:BRK-A) (NYSE:BRK-B) have made a big acquisition. Buffett has made it clear that the biggest obstacle to getting a deal done in recent years has been sky-high valuations. Well, the recent market slide may have helped valuations come back to Earth. There's more than $100 billion in cash on Berkshire's balance sheet, which is about $80 billion more than Buffett feels is necessary to keep on hand. To give you an idea of how much money this is, Berkshire could theoretically acquire a company like Lowe's, Caterpillar, or Qualcomm with just the cash that it already has. To be clear, I don't necessarily think Buffett wants to buy any of these three companies, but I do predict that 2019 is the year Buffett and his team finally make a needle-moving acquisition. These are just my own predictions, and are based on my own opinions of the economy, the stock market, and the individual companies mentioned here. And, as I mentioned, these are intended to be bold predictions, meaning that while I certainly hope I'm right, all of these things are far from certain.